Located in downtown Houston LCD Gallery specializes in representing contemporary and emerging artists. LCD Art Gallery, in partnership with UP Art Studio, is pleased to welcome to Houston, from France, “the father of stencil art”, for more events taking place associated with the “ALL CAPS” art show. Xavier Prou (better known as Blek Le Rat), was one of the first graffiti artists in Paris, and is widely regarded as the founder of the international stencil art movement. His paintings are autobiographical, born of his personal experience, and his art has inspired many post-graffiti street artists. While in Houston, Blek le Rat, is scheduled for public appearances including a screening at the University of Houston-Downtown on Thursday, November 15, 2018 of the movie “Saving Banksy” in which art collector Brian Greif – who acts as executive producer on the documentary – felt compelled to salvage Banksy’s “Haight Street Rat” and have it exhibited for the public in a gallery. Blek le Rat, who was painting rats with stencils years before Banksy’s first rat appeared, makes an appearance in the film. Following the screening, Blek le Rat and Brian Greif will give the audience insight about the film. 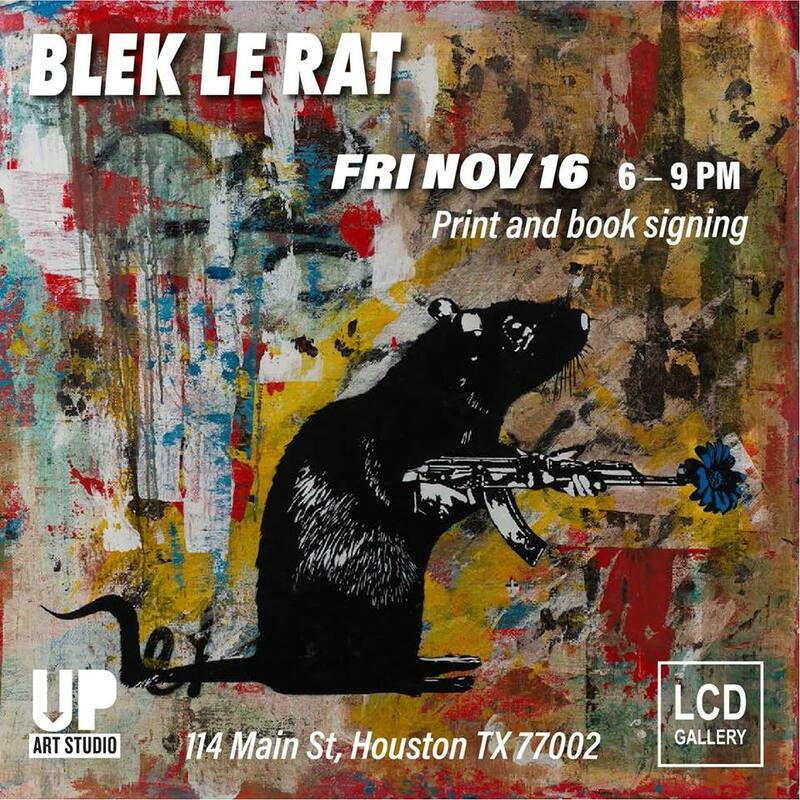 On Friday, November 16, 2018 at LCD Gallery, Blek le Rat will do a walkthrough of the “ALL CAPS” exhibition and will be signing art prints and books, which will be available for purchase. The prints are limited and include five previously sold out editions.